Liberty Garden Hose Reel 704 wall mount design is outstanding. It has a sturdy aluminum frame which has spiraled flourishes, which are usually coated using powder finish of your choice. It is made using cast aluminum, to prevent from rusting. It’s plumbing fixtures are made of brass to prevent leakage. Key features which make the model remain in demand in the competitive market include, this garden reel is another best hose reel on the market today. The Liberty Garden Hose Reel 704 Wall Mount is the easiest to install. It comes fully assembled, hence ready for use. You only need to mount on the wall. The only challenge with the device is that it does not come with mounting hardware, forcing you to use screws of your choice. However, the greatest advantage of the model is the ability to mount it at your convenient height. This Hose Reel has the best finish you will ever across on the market. Its frame is made of spiraled flourishes, which are coated with durable powder, making it classy. Liberty Hose Reel 704 is well engineered, making it suitable for use even in cold winter weather. It is made using cast aluminum and coated with durable powder, preventing it from rust. Also, it features brass fittings which ensure no leakage and cranking of the hoses. 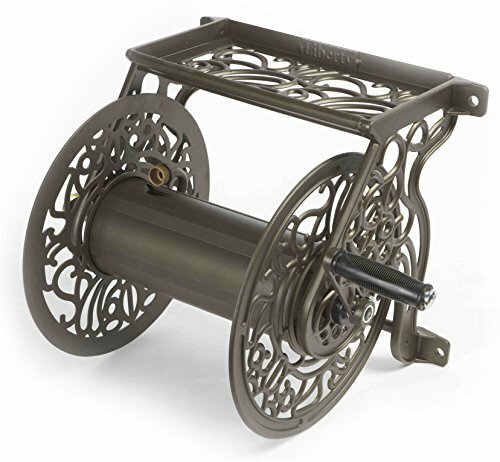 The Liberty Garden 704 Decorative Hose Reel Wall Mount model incorporates a shelf which allows you to handle your garden and watering tools while in use. The design makes it the best model to use for home gardening requirements. It incorporates a five feet leader hose, which makes the cranking with your hose easier. The leader hose makes the winding of the hose easier, by aligning it on the reel. Besides, it ensures there is no leakage. The product has a large capacity with dimensions of 15 inches in length by 22.8 inches width and 15.4 inches in height. The large size fits 125 feet hose correctly. The Liberty Garden 704 model has a handle made of brass. The handle makes the winding and unwinding of the hose easy. Also, the reel rotates smoothly. The hose reel functions well, enabling you to handle a heavy garden hose quickly. You require less energy to pull out the hose since reel glides with the slightest pull. Likewise, rolling the hose back is smooth. You only need to turn the crank with one hand while guiding the hose with the other. The significant disadvantage of the model is a lack of mounting hardware. You need to get your mounting screws. Q. How far off of the ground does it need to be mounted to provide for clearance of the reel? A. You can put it at chest height so the crank could be turned easily. Q. Is the washer replaceable (inside the reel – from where the hose from the faucet connects) have a replaceable washer? Q. does it include mounting hardware? A. It did not come with mounting hardware. The instructions listed the hardware required depending on the surface you mount to. Q. Can the handle only be mounted on the right side? How far from the wall does it stick out? A. It comes pre-assembled right out of the box…It doesn’t look like it’s designed to be adapted. The performance of the device is far much better, compared to plastic hose reels. The cast aluminum frame has spiraled flourishes, which makes it beautiful even when in the front of your house. Besides, it has a stylish finish. The cast aluminum used is coated with durable powder, which prevents it from rusting. The Liberty Garden Hose Reel 704 Wall Mount is easy to use and install. It comes fully assembled, hence no struggle in assembling. The hose reel glides smoothly with the slightest pull, which makes it simpler to handle your heavy garden hose. The model also features a storage tray, which handles your watering and garden tools while in use. It’s constructed using quality materials, hence it is reliable. It has proved to be reliable and efficient, having existed in the market for over fifteen years.